You’ve got to hand it to Breaking Glass Pictures. If nothing else, they have shown a dedication to scour the globe in search of some fresh, independent horror cinema. After delivering Slasher from Germany and Temptation from England, they now bring us Darkness (also known as T.M.A. ), a film from the Czech Republic. It’s a film that roots itself in one of the most fundamental sub-genres of horror: the ghost story of a haunted house that holds decades of deadly secrets within its walls. Marek, a musician in a band, has grown a bit tired of his life of rocking and partying. He takes some time off to pursue another artistic endeavor: painting. He heads off to his childhood home, which is the stuff of local legends. The townsfolk warn Marek about stories of human sacrifices and mysterious Nazi plots that took place there over the years. He soon finds out that these are no mere stories, as the walls mysteriously shake and one of his acquaintances disappears without a trace. As the story unfolds, it seems as though the events of Marek’s own childhood (the death of his parents and the institutionalization of his sister) may be related to all of the mysterious happenings. We’ve seen this type of story a few times before, but it’s one that can still be effective no matter how many times we see it. In the case of Darkness, it doesn’t all quite work, namely because the film is juggling so many plots, and none are explored to any great effect. The film is at its best when it’s focused on Marek and his childhood because it’s a good story, driven by mystery--just what really happened to his parents, and why is his sister in a mental institution? The other sub-plots--most notably, the Nazi-related one--all get tied together by a series of twists and turns at the end of the film. Some of these twists are more effective than others, but Marek’s arc itself is adequately resolved. It’s not the most compelling of stories (mostly because it’s a bit predicable at times), but it works well enough in the end. Getting to that end is a bit more of a chore, though. Though it’s supposed to be a ghost story, actual ghastly happenings are few and far between. The walls shake, and there’s some creepy children’s laughter, but that’s about it. There just doesn’t seem to be enough menace to the proceedings because nothing really happens. One girl disappears, but it’s treated more as weird inconvenience more than anything. There are a few horrific shots and sequences thrown in, but it’s far from a horror tour-de-force. 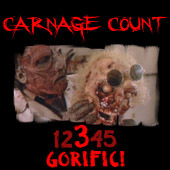 Gore isn’t exactly prevalent, with the exception of one grisly and gratuitous surgery scene that features a limb being severed. I suppose the eventually-revealed Nazi atrocities are chilling examples of human depravity, but even they feel a bit worn out. At the end of the day, that’s what Darkness is in a nutshell: it trudges through well-trodden territory, and it isn’t exactly terrible. Instead, it just doesn’t separate itself very much, despite its overall competence. From a visual standpoint, it’s appropriately shrouded in bleakness and darkness for most of the film, and even the daytime scenes are dreary and foreboding. The overall result is a pretty sterile looking film that only offers up a few effective visuals, namely the house itself, which is a spooky, decrepit environment. The acting is solid enough, with Marek and his bandmates being the most lively characters brought to life. It’s a shame more isn’t done with them because they’d seemingly offer up some meat for the body count; instead, they just drift into the film and right back out again, without much consequence. If you really like ghost stories and films involving characters with a dark, tragic past, Darkness won’t be completely satisfying, but it does offer up some interesting ideas. To check it out, you’ll have to sample Breaking Glass Pictures’s DVD release, which offers a crisp anamorphic transfer and a booming 5.1 surround sound track that’s in the native Czech language with English sub-titles. The lone special feature is a “making-of” documentary, and the film will street on September 7th. Interestingly enough, the film was given a theatrical release by Warner Brothers in the Czech Republic, so I suppose this gives us an idea of the type of mainstream horror from that country. Once it reaches States-side, I doubt it’ll have much of an impact, but it’s not a terrible way to waste an evening if you’re a fan of this sort of thing. Rent it!